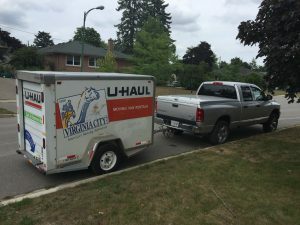 U-Haul trailer is hitched, packed and locked, truck is full of gas, and I’m ready to go. Most of the team is already en route to Dingwall, NS. I leave tomorrow (August 16, 2016) at ~5:30AM EDT. I expect to arrive in Fredericton, NB by 10:45PM ADT, and then will drive to Dingwall, NS the next day. You can track my journey via APRS. The CY9C DXPedition gang has talked about setting up a station at The Markland (where we’re staying the nights before we leave for the island), so keep an ear for them. Stay tuned to my Twitter Feed for updates and media from the Atlantic Cove operating site, and to WW2DX’s Twitter Feed for the same from the North East Point operating site. I look forward to the pile ups. vy 73 de VA3QR/VA3KPJ.